It’s rare I write about a product twice, but Baxter of California Oil Free Moisturiser has continuously been one for the books. I’ve mentioned a few times recently that if you’re a little oily, your skin is often dehydrated – so instead of trying to break down the oil, add lots of hydration to restore the skin’s natural balances. 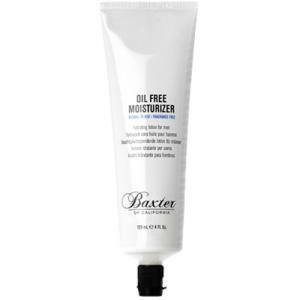 Baxter of California Oil Free Moisturiser. £20. MANKIND. Baxter of California Oil Free Moisturiser is one of the ultimate contenders in this arena, being completely oil free but beautifully rich. It has a very creamy texture, and you’d be fooled into thinking it was oil loaded, but whilst it comforts, calms and smooths the skin; it sinks in and leaves not a trace of residue. Particularly as we head into winter, your going to find your skin is becoming a little more dehydrated and although you might see your skin still throwing out oil, this is often because it’s screaming for water. You’ll find a water base with aloe, and a mineral oil substitute Hydrogenated Polyisobutene, this locks in hydration but again without clogging up your pores and leaving you slick. There’s calming chamomile and skin protecting Vitamin E but more importantly, not a drop of fagrance! It has a very natural, pharmaceutical yet kinda’ natural scent – it’s beautifully diffuclt to describe. You need only the tiniest amount and it’s great on warm, freshly cleansed skin. If you wear any cover or light concealer, it’s a great base! Finally for just £20 Baxter of California Oil Free Moisturiser is a great price and gives something you’d expect from a much pricier moisturizer. Water (Aqua), Hydrogenated Polyisobutene, Octyldodecyl Neopentantoate, Stearic Acid, Glyceryl Stearate, PEG-100 Stearate, Aloe Barbadensis Leaf Extract, Benzophenone-3, Butylene Glycol, Camellia Oleifera Leaf Extract, Carbomer, Cetyl Alcohol, Chamomilla Recutita (Matricaria) Flower Extract, Dimethicone, Disodium EDTA, Propylene Glycol, Retinyl Palmitate, Tocopheryl Acetate, Triethanolamine, Xanthan Gum, Butylparaben, Ethylparaben, Isobutylparaben, Methylparaben, Phenoxyethanol, Propylparaben. This article first appeared on MANFACE written by Thom Watson. It was published on Friday 23rd September 2016 and was last updated on Monday 3rd April 2017 at 12:42pm. It's categorised under Baxter of California, Dry / Dehydrated Skin, Moisturise where you'll find more related content.